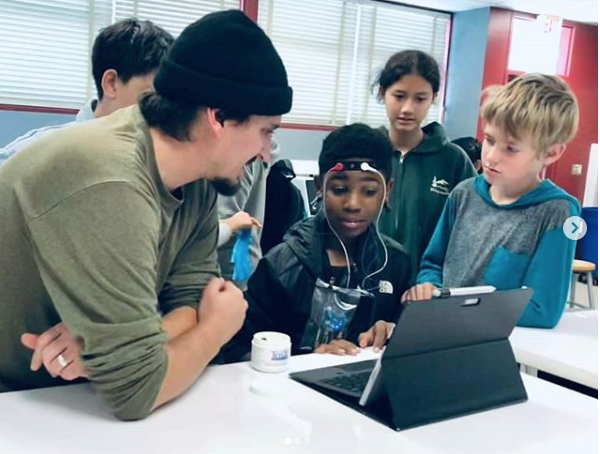 As a volunteer and resource council member, my duties to NW Noggin include conducting outreach, planning events, and working to build devices that are engaging for our local youth. My current plans are to prototype and pilot electrophysiology devices that local school kids could keep in the classroom, to conduct science all year long. I began volunteering with NW Noggin in September of 2017 and instantly clicked with Bill and Jeff's mission to bring art-infused neuroscience educational programming to kids in the Portland area. When I was a kid, I struggled to engage myself with topics in the science, technology, engineering, and math (STEM) domain at school, but was always interested in learning more about them. I definitely wish I would have had programing like Noggin around, as I feel this would have led to better engagement and performance in school. The look on a kid's face as they recognize that they can discover topics in neuroscience in a tangible, hands-on way is very special and pushes a lot of us volunteers to keep working with Bill and Jeff. As the Resource Council Member for Public Access Technology, my primary job on visits is to get kids into neuroscience by providing knowledge and equipment to get them measuring activity from the brain and body. Specifically, I do this with DIY and open-source electrophysiology devices that can measure brain waves, heart beats, skin responses, and more! Kids really enjoy hooking themselves and their peers up to explore more about the electrical signals in their bodies. I believe this also gives them a sense that, "hey, I really am a neuroscientist; look at these brain waves I'm exploring!" Although it's been really cool to go to classrooms and share my knowledge and tools I have with kiddos in our community, I'd really like to be able to have a device that I can show the kids how to use, then leave behind, so that the kids can conduct science year round. I've been prototyping an Arduino shield that can do exactly this, and hope to have a working model ready to test out early 2019. It's been a huge challenge since I don't have much of an engineering or programming background, but I feel confident that I'll be able to network and find people to help me with the fine details. 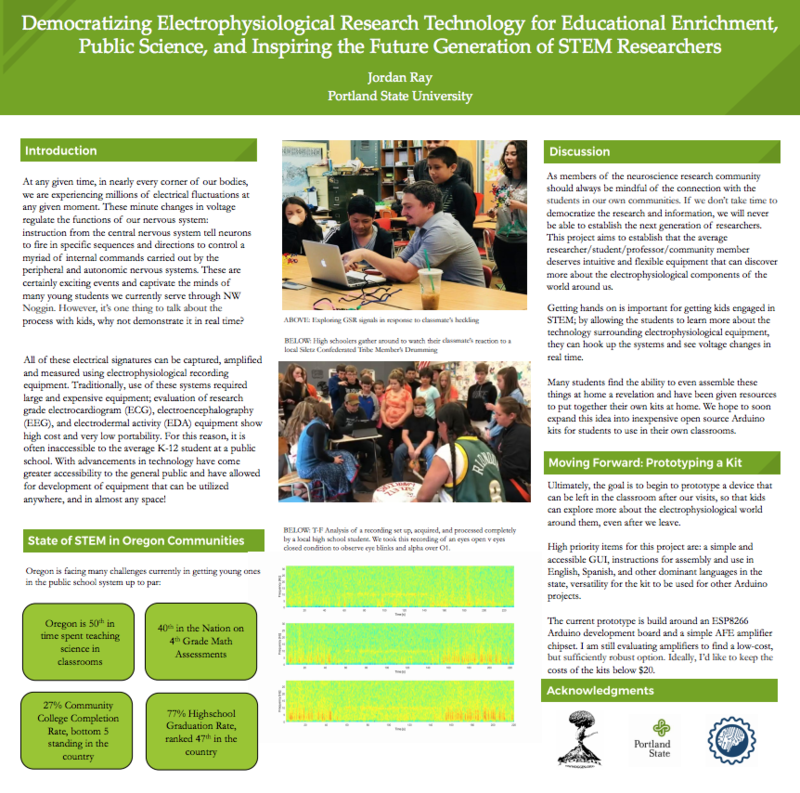 In November 2018, I took this idea of democratizing electrophysiology equipment to the Society for Neuroscience conference in San Diego and presented on what I've done here in the community and what my plans are. I was very excited to meet people from all over the world and get some good contacts to begin putting together an international team dedicated to getting more electrophysiology devices to kids everywhere.